Colorado took a bite out of the Big Apple over the weekend! Max Manson and Anna Hall were the big winners this past weekend, and they came to their titles from two entirely different directions. Hall was a clear favorite to take the pentathlon title. As two-time defending champ, and high school record holder, the talk was more along the lines of: Will she break her own record? Manson, on the other hand, was one of a few favorites in the pole vault, but knew he'd need a big performance in the Big Apple to claim the title, and that's exactly what he did. The Monarch senior entered the meet with a lifetime best of 17-3.5, done outdoors at last year's state meet, and left with a 17-5.5 PR for his first national title. The mark is now just two inches shy of his father's Colorado record of 17-7.5. Hall made no contest of the pentathlon. The Valor Christian senior dominated the field with a 4,209 points, just shy of her national record of 4,302. Two of her biggest performances came in high jump, and the 800. Hall went 5-11.5 to win the high jump in an indoor best, and she cruised away with a 2:16.52 800 to cap the meet with another win. All in all, she won four out of five events in dominating fashion. That's Halls third consecutive NBNI pentathlon title. 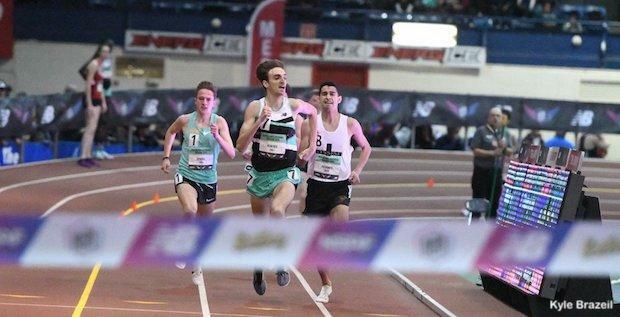 Onwards to "Nearly Three" nationals titles, were Cole Sprout was in prime position to claim his first national title in the mile. The Valor Christian junior was in the lead with 200 to go, but got cut off, nearly tripped, then pushed again by eventual winner Jake Renfree as he sprinted by. After catching his fall and staggering a few steps, Sprout regrouped in third place and started kicking. His final drive to the finish on the short straightaway made the difference, as Sprout nabbed the runner-up finish in the final strides, running a huge PR of 4:06.68. He was less than half a second behind Renfree, who won the event in 4:06.39. And Sprout wasn't the only Coloradan to claim silver. Brighton's Cameron Harris saved his best performance for last, as he went on to finish second in the 60 Hurdles in a huge PR of 7.81. The race capped a stellar season for the senior, who is bound to be a force this outdoor season. Sincere Rhea won the event in 7.69. While quite a few Colorado athletes battled for national titles, there were a slew of Honorable Mentions as well. Just off the podium was Mason Anthony, who turned in another big performance in the long jump. The Elizabeth senior went 23-3.5 to finish 10th. Likewise, Peak tp Peak's Quinn McConnell cracked 5 in the mile, running 4:58 to finish 16th, while teammate Anna Shults won the Emerging Elite section of the mile in 4:57. Lanie Szuch tallied a big run of her own, finishing 13th in the Emerging Elite 2 mile, running 10:58. Szuch doubled back to finish sixth in the Freshmen Mile in 5:07. On the boy's side of the Freshmen Mile Bryce Reeburgh finished 15th in a big PR of 4:36. And keep an eye on Colorado's future in the event: Reese Tucker and Lily Mourer finished third and sixth in the Junior High Mile. Tucker ran 5:15, just ahead of Mourer's 5:23.